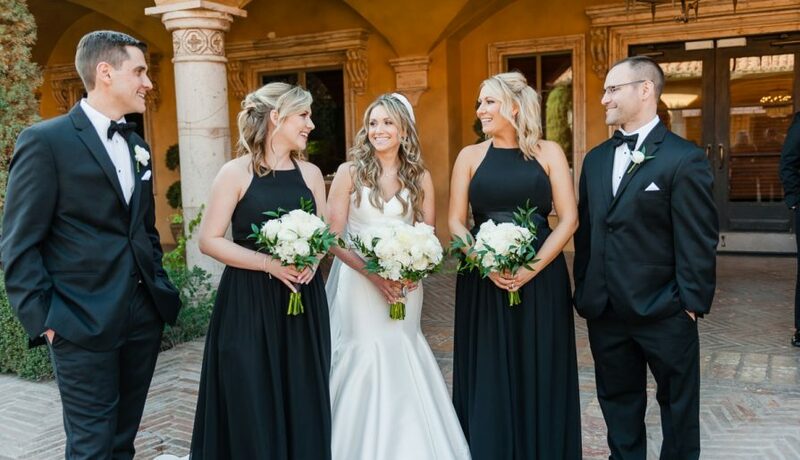 As a bride, if you’ve been wondering about Azazie bridesmaid dresses, today is your lucky day. 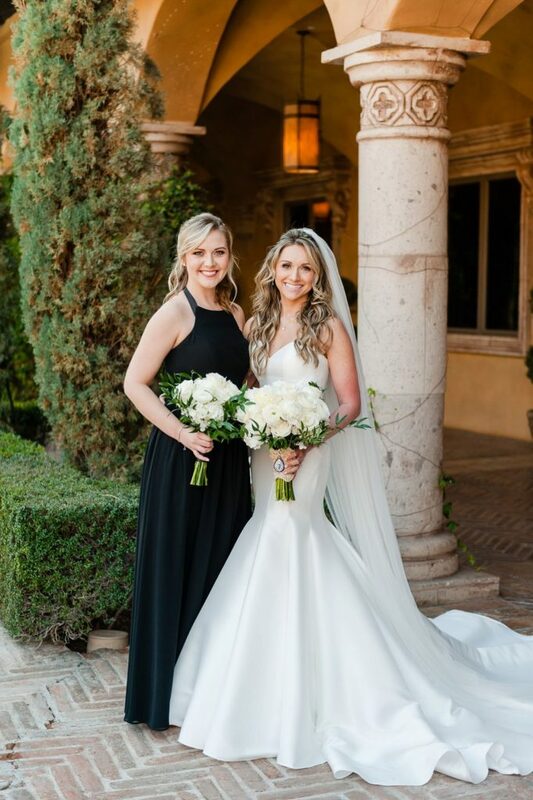 I had the pleasure of wearing one of their pieces when I was a bridesmaid in my sister-in-law’s Phoenix wedding back in January, and today I’m sharing the full scoop! While I’ve been in many weddings before, I’ve never ordered a bridesmaid dress from an online retailer. The bride and us ladies have always headed to a local boutique for a traditional shopping experience. However, modern times call for modern measures and hitting up the world wide web for your maids’ attire is the new way to shop. Admittedly, I was nervous at first – what will the quality be like, how fast will it arrive, what if we don’t find a style we like? These and many other questions ran through my head. However, after my Azazie bridesmaid dress experience, I have to say I’m now a HUGE fan! Here are just a few reasons why! 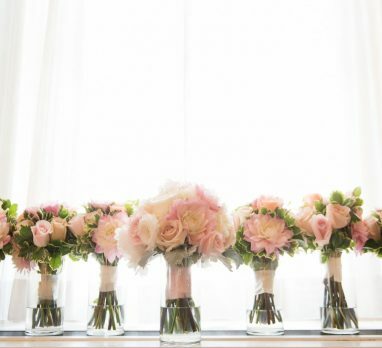 They offer countless styles, all for the modern bridesmaid. Every bridesmaid has nightmares of being forced to wear a hideous dress in a completely unflattering color. Azazie’s vast selection makes that virtually impossible. With over 400 styles in more than 30 colors, there is something to suit every taste, palette, and body type. They offer trendy off-the-shoulder pieces, as well as classic silhouettes. Short, long, or midi. Sequin, lace, or tulle. Strapless, cap sleeves, or convertible straps. If it’s in the current world of bridesmaid fashion, Azazie carries it. 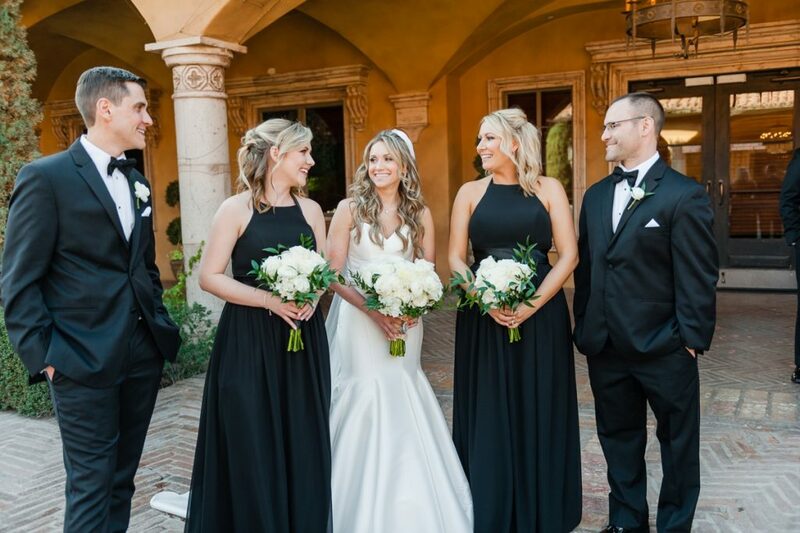 Their incredible inventory also makes it super easy to embrace the oh-so-popular mix and match bridesmaid dress trend! 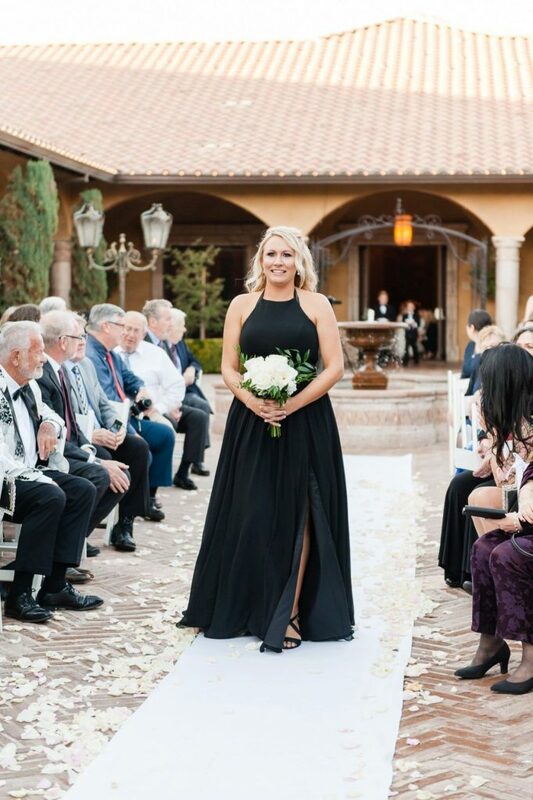 For the record, Shauna chose the Azazie Aurora style in classic black. 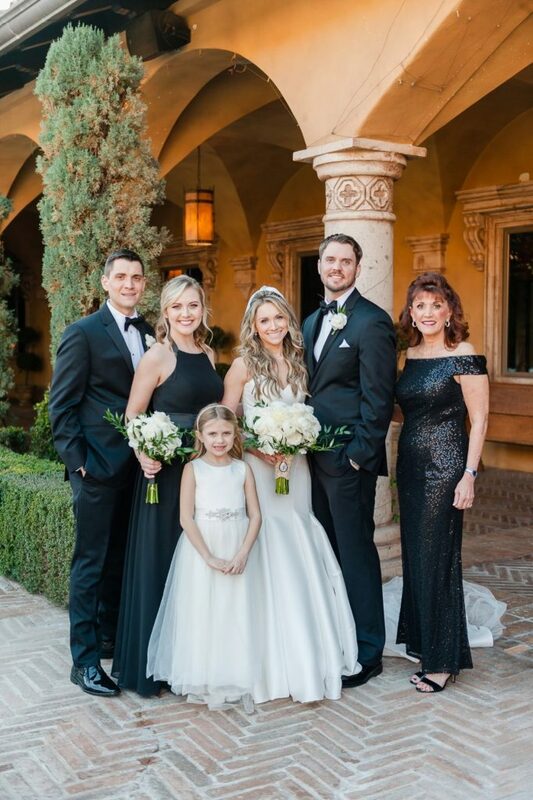 Her wedding style was timeless and elegant with a chic color palette of blush pink, white, and black with hints of metallic. The floor length chiffon number was perfect for the upscale affair, while the pockets and leg slit wove in modern fashion trends. The halter neckline and wide satin banded waist flattered our various figures, making this dress a fantastic choice all around! You can customize the fit. As women, we all know how hard it can be to find clothing that fits your exact measurements. 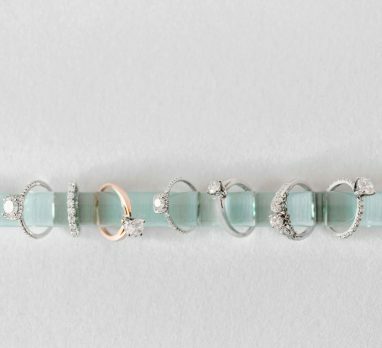 How often can we find something off-the-rack that fits perfectly in every way? Azazie understands this, which is why they offer custom sizing. 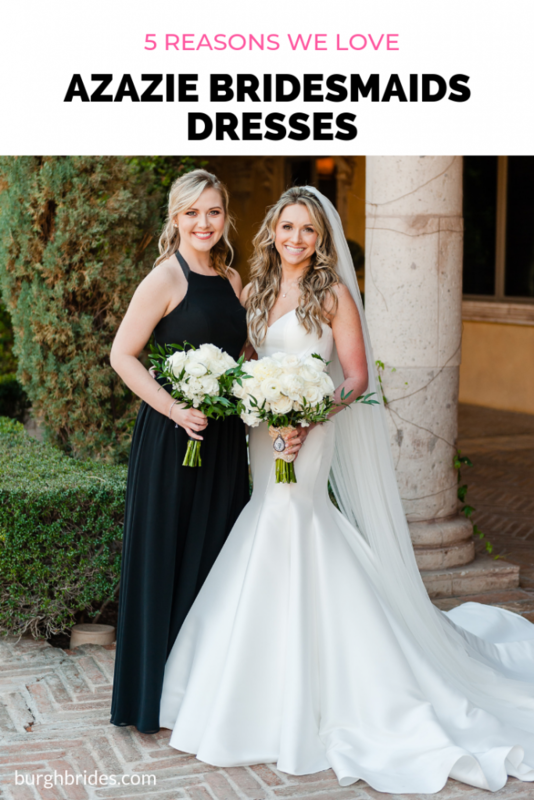 While their size chart makes it easy to approximate which dress size to order, if you’re still having trouble, you can basically have the dress tailor made for your body. Enter your bust, waist, hips, height, and hollow-to-floor measurements for a custom fit just for you. The best part about it? IT’S TOTALLY FREE! No additional charges whatsoever. You can order samples and try on at home. Want to see what a dress looks like on your girls before committing to it? Want to feel the fabric before saying yes? Still want your ladies to have that bridesmaid dress shopping experience? Azazie to the rescue again with their sample collection. Select up to 3 dresses at $10 each (to cover shipping), try on in the comfort of your own home (or plan a super fun try-on party with champs, music, and your girls), and return within one week with a pre-paid label. BOOM. Dress shopping just became fun again! Being a bridesmaid is expensive. There is the shoes, makeup, hair, bridal shower, bridal shower gift, bachelorette party/weekend, wedding gift, etc. etc. etc.! If you want to do your ladies a favor, keep the dress you choose from breaking the bank. 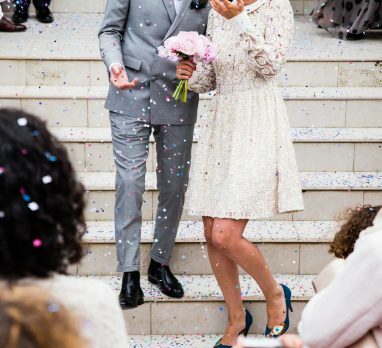 With most styles between $100-150, Azazie makes being in a wedding incredibly bank account friendly. The quality is surprisingly high. Don’t think you will be sacrificing quality just because the price is affordable. When my dress arrived in the mail, I was pleasantly surprised at how nice it was! First, it arrived in a sturdy garment bag that kept it wrinkle-free. The chiffon fabric was airy and flowy, while the under layers felt soft (not itchy) against my skin. Even the satin waist and halter tie felt luxurious. 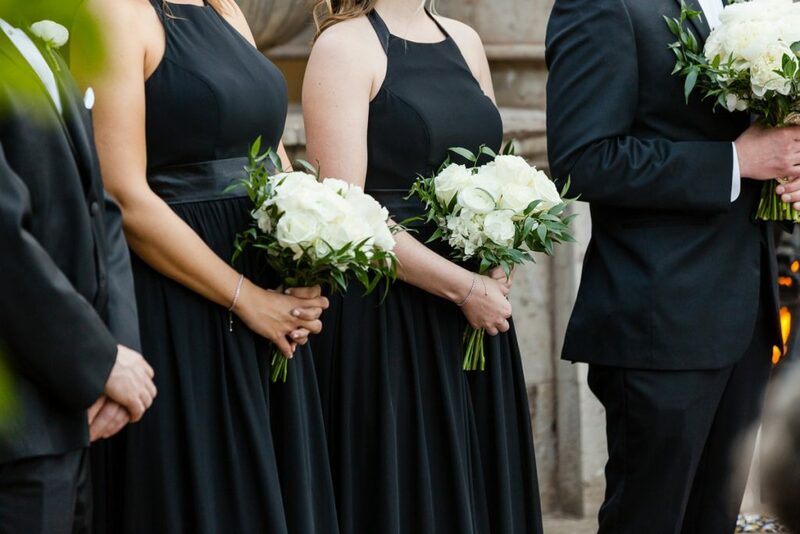 For $150, this bridesmaid dress was MUCH nicer than others for which I’ve paid nearly twice the price. Budget friendly AND cute? Yes, please! What are you dressing your ladies in? Did you opt for an in-store shopping experience or an online retailer? If you’re still on the hunt for the most stylish dresses, check out Azazie! 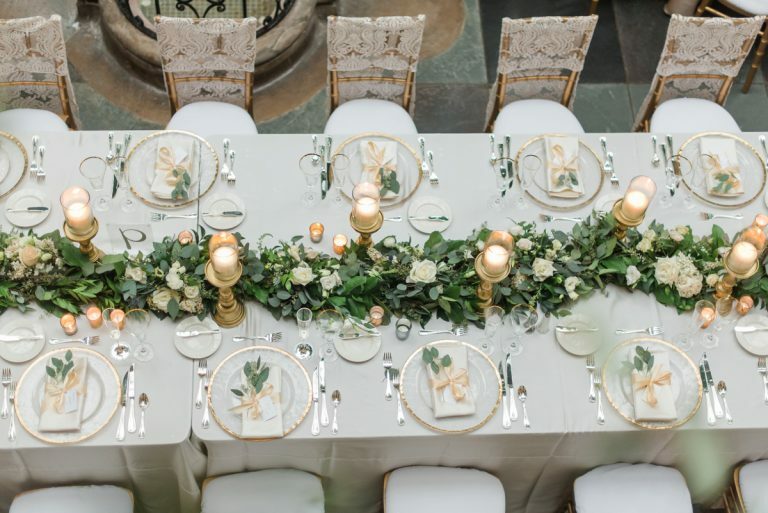 A HUGE thanks to Azazie for teaming up with Burgh Brides to bring you this post. While we were compensated for our work, all writing, thoughts, opinions, recommendations, and love for the brand are our own. You can read our full sponsored content disclosure policy here.